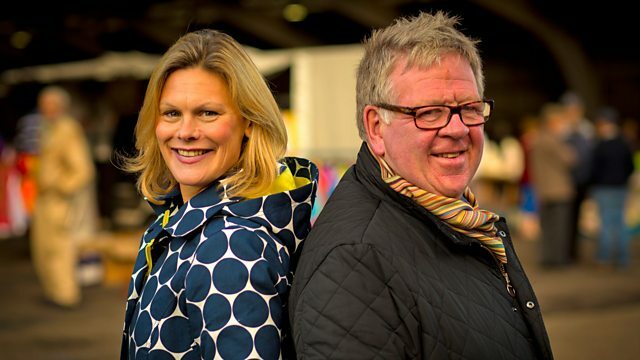 It's a trip to a West Sussex antiques fair for Phil Serrell and Kate Bliss as they do battle to make the most profit out of up to £750 of collectables. Browse content similar to Phil Serrell v Kate Bliss - UK Antiques Fair. Check below for episodes and series from the same categories and more! ..putting their reputations on the line! hunt Kate Bliss against the crafty wiles of Phil "The Fox" Serrell. and look at its bottom. ..and Phil gets a few home truths. Oh, Philip, it's only an old brick. Ahh! Good morning and welcome, admirers of antiquities everywhere. We're up with the sun at Ardingly Antiques Fair in West Sussex today. sell and earn a winning profit. First up, it's a thoroughbred filly of foraging. I'm going to give Philip "The Fox" a run for his money. out and snare the best bargains and then sell them on at a profit. -Top of the morning to you. -Well, here we are - Ardingly. -It's a lovely sunny day. -Are you going to spend all of it? Well, do you know, I might go some today. I really feel like something... Mm...I don't know, meaty, quality. -Well, it's a good fair, isn't it? There's some good stuff here. There's a lot of very good stuff. And where are you going to go? Well, this is the thing, I think I might check out the sheds first. -Big and lumpy - that's the answer, isn't it? -Yeah, lumpy is your thing. -Go on, then. Meet you for coffee. -All right, see you in a bit. I'll just have a quick look here. in order to snaffle the best bargains. Hm, very cunning. We're going to have to watch these two. Now, what else is Kate plotting? Well, there's loads to go at here. to go for something of quality. the Bliss is certainly going to be classy. So only the very best will do for our Kate today. And what's Phil got up his sleeve? Or should that be, under his scarf? I'm at a massive UK antique fair. There are bits and goodies everywhere. What I've got to do is keep focused, stay calm and buy sensibly. all I'm doing is buying a profit. Yes, wise words, Phil, wise, wise words. he hotfoots it to the least sensible stall he can find! There are old 1950s drill guns. I've turned them into Dan Dare Comics. -Turned them into Dan Dare ray gun lamps. -You've got some vision, haven't you? but at least Kate is sticking to her guns by heading straight inside. -This one here is how much? even made it into the building. And if I took the two, could you do me...? Hold on, was that French? Time for Kate to bring out her secret weapon. Hm. He's not budging and the French isn't working. Come on, Kate! What's the best on that one? Can you do a wee bit more for me? Has Kate met her nemesis? -What's it absolutely got to be? Well, I have my first purchase and we're off to a cracking start. was the lovely Regent Street name. but I still think there's profit. So Kate's strategy for buying classy is costing her serious money. That's almost a third of her budget gone on one purchase. How's Phil getting on with his search for the sensible? That is a mould for some plumbing...use. and then run the mould. I think that's quite fun, actually. 25 quid and I'll buy it. Go on, then. I'll buy that off you. I think that's a bit of fun. Quite what the hell I'm ever going to do with it, I don't know. -£28. Thank you very much indeed. like that, but I think if you mount it like that, it looks quite cool. to perhaps turn that into a table light or something like that. who needs a mould for a drainage pipe. That's going to happen, isn't it? is very much a thing of the past, but Kate is back on track. Well, I hate to leave the sunshine, but I'm going to explore in there! Now, remember, Kate, you're looking for something classy! For a dressing gown, my husband would have a fit. Oh! Just my colour, though. Love it! Oh, la-dee-dah! Now, that's more like it! What do you think? Always try it for size! And that necklace isn't the only thing to have caught Kate's eye. I've also spotted these little silver coffee spoons. -What's your best on these? stirring herself firmly into the lead with three items to Phil's one. and got myself a good deal. So we have a costume jewellery necklace for £10. but costume jewellery is really coming back in at the moment. And I think for a tenner, that's a seriously good buy. dating from 1924, so the George V period. But these have got some really sweet coffee beans finials. Now, these aren't rare. You see them about from time to time. and I smell a barista for my purchaser. not one to be left behind, has bagged himself a bit of old iron. This is a 19th-century French iron radiator cover. What on earth have I just spent £170 on an iron radiator cover for? Well, I think this will make a really cool coffee table. This is shabby chic at its shabbiest. of money invested in this. his total number of items to two. But leading lady Kate is determined to stay ahead. OK, I'm all done in here, so I'm heading outside on The Fox trail. Watch out, Foxy, Miss Bliss has got some little helpers. Phil's found something to warm his paws on. Well, I'll give you a clue. put your foot on it and it warms it. I think that's wicked. -How much is your foot warmer, my love? OK, can I put that down? but I'm going to see if I can buy something else off you. -I just got to find it, that's all. Wiley Phil knows it sometimes pays to buy a bundle. How much are those, my love, please? You can have those for...£25. What's the best on the two? Er, you can have the two for 20? Do you know what, I'm not even going to argue with you. -Well, I didn't think you were. -and it would have been churlish to have offered you less. and this would have sat on the floor in my carriage. And I just plunk my feet on it. I would have had these lovely silver-plated tumblers. And I would have had a quick snifter just to keep me warm. Keep the feet warm, keep the inner man warm. Kate warms her heart as she spots a frame of embroidered war cards. sort of £25-£30, something like that. -40, thank you very much. -Lovely. Thank you very much. but I bought it because I think these are really underrated. of social history. I paid £40. is at a private sentimental collector. and turn that £40 into profit. and who's scrabbling around in the undergrowth. Our dealers started the day with £750 to spend. and has spent £305 leaving £445 still in the kitty. but spent £218 leaving him £532 to play with. All that spending has left our duo in need of a coffee break. -There we are, a life-saver. -So how have you got on? I was going to go inside, which was good. -and around there, it's been quite good. I've enjoyed it. -And I'm sort of pleased with what I've got. Yeah, I couldn't possibly tell you what it was, of course, but you know? -Sounds far too confident to me. I don't think these guys are going to hang around for very long. -So I'm going to be speedy. -I leave you to finish your coffee and I am out of here. See you later. Thanks for the drink. Oh, the mind games are rife today! in a contemporary brass plaque. the offices of a chartered quantity surveyor in brass. places, but for £15, you couldn't buy the brass for that! Quick Kate's speedy strategy pays off as she zooms into the lead. How much is the boy? The boy on its own is 2,850. Trouble is I've got a good eye and a poor pocket. I thought we were going to shake on a deal there! amount on this antique poster. I've just bought this off a camera-shy dealer for only £30. I think it's a really cool thing. and look what they've got to sell. "121 good Oxfordshire down sheep, four steers..."
That's cattle to you and I. "two nags, harness and a fat pig." I think this is a really, really lovely thing. and if that firm is still going, I reckon they would love to buy this. up their opponent's determination to win. and is buying like fury. So, between you and me, I'm slightly feeling the pressure. ..she will be competitive, trust me. So I just need to be really on my guard. swoops on some slightly damaged gold cuff links for £50. -That's great. Thanks so much. and bought something which is damaged. and repairing it is a five-minute job. I think there's still a profit there. desperate to sink his teeth into something substantial. that's just a bit punchy, a bit meaty. Before long, he pounces on a pair of urns. Where do you think these were made? They could be Skey's of Tamworth. They are not marked, but they very rarely were. -And how old do you think they are? -I think they're 19th century. -Yeah, they are salt glazed. -What did you say the best is? -It's got to be £80. OK, I'm going to buy those off of you, good sir. -Two, four, six, eight. There we go. but nothing gets past his sharp gaze. when Queen Victoria was sat on the throne. Sorry, ma'am. Now, salt glazed? Well, it's a simple term, really. around here and hopefully, hopefully, I might just have someone for them. And with that buy in the bag, The Fox calls it a day. Diamonds and ruby. They're nice, aren't they? Contemporary. I'll do 150. That's it, I can't do any more. and Kate's day of dealing has come to a glittering end. Now, my eye caught these. after the French '1,000 grains'. and at £150, I don't think they're expensive. these, there's got to be a sparkling profit. Well, whether Kate will outshine her opponent remains to be seen. let's see how they got on today. Kate and Phil each started the day with £750 of their own money. Kate Bliss has seven purchases and forked out £520. Phil Serrell has bought less and spent less - six items for £328. there's a chance to eye up the competition. As ever, we differ quite considerably. So which is your best bit? My favourite bit is probably the earrings. -And they are Art Deco, aren't they? -No, they are Art Deco-style. because I think that is a lovely piece of history. -that might just buy it off me, but you never know. It was sold as a radiator cover. -Might be a window cover, I don't know. Piece of plate glass on the top and I think that would look really cool. -My favourite piece, I love this. If that had got PMS there, I know who would buy that off you. -It should be really for what it cost. -Well, how much was it? -you'd better tell me some of your contacts, then. selling caps as the hunt for pure profit is their new driving force. the biggest possible profits to go to their chosen charities. how is Phil feeling about his assorted acquisitions? If I'm ever going to be an auctioneer again, Jonas Paxton. What a great name and his fat pig. There you are. That poster, £30. I don't see how I can fail with that. they were priced originally at £160. and I think they are really stylish things to have in your garden. My nest of tumblers, silver-plated at £15, I can't fail with those. And what a great bit of social history, that foot warmer. Cost £5. If you want a bit of fun, what about that? It's a pipe mould. Well, I think it is. but a drainage pipe of some sort. But for me the star of the show is this, I absolutely love this. This is going to be the basis of a really funky table. Well, that is Serrell vision. really careful with it because it can get a little out of focus. Kate's getting down to business in Hereford. Now, I have gone a little bit girlie with at least some of my purchases. Because we've got a few little sparkly items here. And my absolute favourite is this necklace. I could get a serious profit for this. It's worth an awful lot more than £10 in my eyes. My wild card is my suitcase. a look at inside, and I'm pretty sure has been replaced as well. So I'm hoping I can find a profit with this. is the World War I silks and I love these. the amount of work and the sentiments that they sum up. but it's all going to depend on my suitcase and I could come unstuck. the silver coffee spoons, and the gold cuff links. buyers. But remember, no deal is truly sealed until the handshake. but it's Phil who is first to make a break for it. and he thinks he's found it the perfect home. of carriages and horse-drawn vehicles. And which carriage would be complete without a foot warmer? trustee Mary into buying it as an addition to the collection. Well, I went to an antique fair and I bought this foot warmer. rather like one of these. -It looks like a brick, Philip! -It's lovely. That's just what it is. -You are holding now a very hot brick. That could go in the bishop's carriage beautifully. -Now, the thing is, this was very expensive. Was it? How much? It's only a brick, Philip! £25 and £35 for it. Oh, Philip, it's only an old brick! Looks like Foxy's met his match! -Make me an offer I can't refuse. You are supposed to be a gentle lady who's a pushover. -You're not supposed to give me a hard time. -Where did that come from?! -As it's you, Philip. As it's you. but I came close to getting my fingers burnt there. But I tell you what, that is still just a tidy profit. with grand plans for the costume necklace that cost her £10. really belongs, to a luxurious designer boutique. the shop's jewellery buyer, to look it over. -So, I thought it was stunning when I saw it. -OK. It's a beautiful piece. I mean, you could definitely see it in our shop. and we do like to sell it with a maker's mark. -..which obviously will devalue it. Kate's got her work cut out here. she said roughly around the £100-£150 mark. Yes, I would be more willing to pay £80 to £120. and if we were going to sell it on, it would be devalued by that. -I want to take my little bit of profit. What if I said - bang in the middle, straight £100? That's her first profit in the bag and it's a shimmering £90. Phil's travelled down to Rutland with his 19th-century ironware. and decided to try and sell it to Tom, who is a furniture restorer. -That's a bit different, isn't it? that it was a radiator cover. -And I've given it a great deal of thought. A radiator cover to start with would only have three sides. -It wouldn't have four sides. But that'd be the same again. You wouldn't have four sides, would you? -Table on there, nice slab of glass. Now, the reason why I haven't done this is twofold. I've got the vision, it's the ability to get it get there. -We've got a few guys that could do that. The scroll on it and the finish. But I love the fact that it's au naturel. You've got bits of paint on it. You won't get this sand blasted, will you? No, well, you could but it'd be a shame. And you're not going to get it painted? No, that's just exactly what you want, isn't it? As is. Just the way it is. But what it wants is some glass on there. I think probably clear glass. I can see that would work well. Good spot there. I mean, it's cost me £170 and I had some interest in it. Have you got 350 quid? I have got 350 quid but I'm going to make you an offer. I'll give you £300 for it done, there, now. I'll get the rubber widgets, get the lot sorted. That was a very impressive bit of money making! Our antiques athletes are neck and neck with two sales apiece. Can Kate make it three with the ruby and diamond earrings? and I've brought them here to Cheltenham to a jeweller's. They haven't seen them yet so it could go either way. but will jeweller Casey want them for a rock-bottom price? These are the earrings that I told you about on the telephone. I know you haven't seen them so there we go. Oh, they're lovely, aren't they? and diamonds around the outside. Little brilliant-cut diamonds. Now, you mentioned yesterday you think that they're probably modern. Being in a square mount, it sort of suggests the Art Deco style. -But looking at them, I think they're pretty modern. Nice little princess-cut ruby in the centre. -So princess-cut because it square? -And then has facets on the top as opposed to a square cut. it probably would have been a square cut or a step cut. It would have been, yeah. Flatter. So that's a good indication of date, actually, isn't it? -How the stones are cut. brighter. So I'll just be a couple of minutes, if that's OK.
-I think they are very saleable. -so I will be prepared to make you an offer. And the offer is £150. I could really do with about £190. I'll give you £175 for them. If you can do £180, I can do a deal. And that's £30 added to Kate's sparkling profit pot. Yes, that's the spirit, Miss Bliss! to shift his mysterious wooden mould. I'm here to see Mark, who I play racquetball against. but also he'll tell me just what it is! Will Phil be able to build on his £28 investment? He's donning a hard hat so he must mean business! -Remember I told you about it? -I paid 28 quid for it, he said it was a drain mould. as decorative as it is if it was a mould, would you? -It looks more like a model, really. -So it's a working model for a drain? -I quite like it, though. Is it the sort of thing you might be interested in buying? -Yeah, I think I would. so I could actually adapt it to make a bit of a lamp to go on my desk. -That would be quite cool, wouldn't it? Well, I was hoping I might have got 50 quid for it. -That's what you call a sharp intake of breath, isn't it? And you've got to get back to this before it all goes off. Now, that's £12 added to his balance sheet. let's see who's rolling in it and who's counting the pennies. but she's hoping to play her cards right in the Cotswolds. and I've come to see Richard. and I'm hoping this will be just up his street. will this sale be something to write home about? -What's that you got in your hand? I thought might be up your street. -I know you've got a huge variety in here, haven't you? -First World War postcards, or silks, as they're called. they were hand-embroidered by women on the Western Front. And it's, actually, was a really important source of income for them. -Because the soldiers would buy them to send home to loved ones. This one, I think, is really sweet. to have a look to see if there were any personalised messages. -That would be interesting, yeah. Oh, look. We've got all sorts of addresses on here. "but remembrance from your loving friend." "From Arthur. Kiss, kiss, kiss." cos it shows they were used. -They were actually bought in Flanders and sent back. In this case, to County Durham. -It's a shame we're not in County Durham, really. -Yeah. So what are you talking? -So, what am I talking? for around, sort of, £60-£90. -I was thinking more about the £50 mark, to be honest. I could do with a wee bit more than 50, I have to say. I mean, could you meet me somewhere around 70? Could I say 65? And you've got a deal? -Go on, why not? All right, 65. -That's really kind, thank you very much indeed. That's a profit of £25 and Kate is delighted. Well, a little bit of profit. But what an exciting discovery to find those inscriptions. when she sells them to Hereford jeweller Robert. it's time for Foxy to get his hands dirty. I've known for 35 years. Now, most people come here looking to buy garden urns. I'm going to try and sell them a couple. -Hi, Will, how are you? I'm glad you've seen these. I was walking round an antique fair and I saw that. -That's the price the guy was asking for them. Just want you to bear that in mind, all right? -All I can see is pots. I mean, he was asking 160 quid for it. -I don't think they're going to fetch £160. So, what are you going to bid me, then? That's me £30 in a bad place, isn't it? So, I've got to make a profit. Hm, Foxy certainly seems to have grasped the idea of the competition. He just needs Will to do the same. -You still haven't got this, have you? Well, I think my best offer would be £100. -And then, we'll plant those up and use them for display. but still walks away with £20 profit. -You can get your hands dirty. -Look at this. Now, you have to tap its bottom, don't you? country pursuits shop owner Tim. Now, our selling supremos are neck and neck. Kate packs her trunk and says goodbye to Hereford. Kate's sales pitch to Vienetta will have to pack a punch. some of these perish on the seams quite easily. -But this one, actually, is not in bad order. -I would say it dates from about 1910. -Certainly Edwardian, I would say. -you've got Edward & Sons, Regent Street. And then, of course, by royal appointment. -I do like to have a name. I think that's most important. -And also, with the initials on the top, it's had a life. -It would need some attention to the skin. because it is using the skin from a dead animal. But it is well over 100 years old. So is it the sort of thing you think would go well here? It is the sort of thing I could sell. Oh, yes, I've sold crocodile. I have some crocodile here at the moment. Whereabouts do you see it, price-wise? I would think, probably, about £280? Could you do just a tiny bit more and say, £290? -All right, that's great for me. And that deal has put £60 profit in Kate's bag. to a quantity surveyor in her hometown of Hereford. to sell his final item. The 19th-century auction poster he bought for £30. Phil is using every ounce of his experience to drum up a sale. I've got an auction poster for a 19th-century farm sale. And I've got to sell it and I reckon you could just be the man. Sells the poster for a not-to-be-sniffed-at £10 profit. That's me, just like my auction poster. So, our experts have shut up shop. Who will be doing their happy dance? And who will be warbling their sad song? First, a quick reminder of how much they spent at the antiques fair. Kate did seven deals. spending a total of £520. Phil did six deals and spent £328. But who made the most profit? -Whoa. I found that really tough. -Do you know? You're not the only one. -It was a tough one, wasn't it? -What was your best thing? I tell you what one of the nicest things was. -And that was with my First World War silks. Well, for the potential purchaser, I took the back off. -on the back of them. So, that was a great discovery. Do you remember that sort of radiator cage? make it into a car and all the other usual rubbish. -I was going to let someone do it who knew what they were doing. -But that was my best thing, really. -Yeah, let's have a look. Come on. Ready. -Well, do you know what did it for me? I think I bought a few girlie bits, a few bits of jewellery. You know, you've got to invest in a few girlie things. I think I need to explore my feminine side. stalked the sellables, sitting secretly amongst the stalls. Well, that's an unexpected pleasure. And I'm sure it was my sparkly things that did the trick. it might have been a different story. Phil will be doing all he can to redeem himself tomorrow. In the ultimate antiques challenge. The Put Your Money Showdown. It's a trip to a West Sussex antiques fair for Phil Serrell and Kate Bliss as they do battle to make the most profit out of up to £750 of collectables. Kate meets her match on the haggling front and Phil is put to the test selling an 'old brick'.